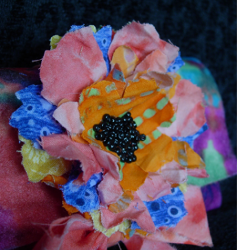 Go crazy with color and make these Burst of Color Fabric Flowers from Tiffany Windsor. These flower crafts will brighten up any room in your home. Not only are they a low-cost, minimal-effort alternative to real flowers, you can put together color combinations that can't be found in nature. For instance, you're able to experiment with wild combos like neon and pastels. Once you're satisfied with their colors, you can make brooches and hair accessories with these eye-popping accents. This no-sew project is a piece of cake. After all, there's no watering required! 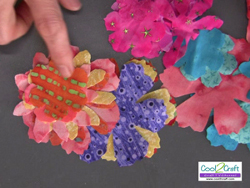 Die cut or hand cut flower petals from fabric. I like to use 6 – 9 petals for my flowers. Vary the sizes and shapes for fullness. 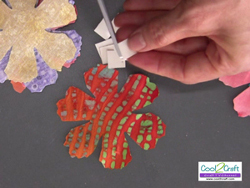 Cut Aleene’s Fabric Fusion Peel & Stick Sheets to size to fit in between flower petal layers. 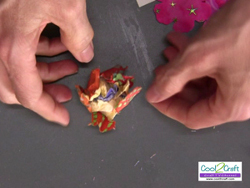 Peel paper liner from adhesive and press onto petal. 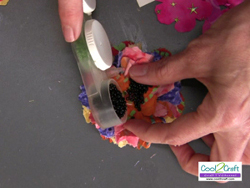 Continue to add adhesive between each petal layer until you have built up 6 – 9 layers. Next, press into a ball and roll between hands. This will ruffle the edges of the cut fabric. Open flower and next start to roll the top petal layer into a ball in the center of the flower. 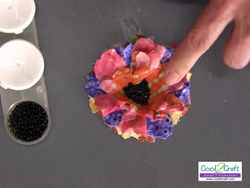 Continue to add each layer to the ball by pulling the petals up and pressing into a ball in the center of the flower. Repeat for all layers until the entire flower is rolled into a ball. Press firmly down on the top of flower to ruffle petals. Carefully open the flower to reveal the center. 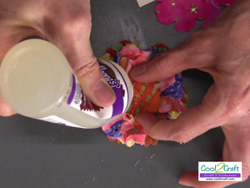 Squeeze Aleene’s Fabric Fusion Permanent Glue into the center of the flower to create a puddle of glue. Pour seed beads into glue. Gently tap the seed beads into glue with finger. Shake off excess beads into a container. Let flower dry overnight. Can be used on washable wearables or other crafting projects after glue has cured according to bottle instructions. 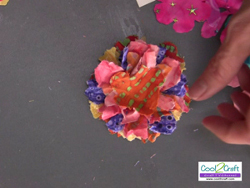 For a comprehensive video tutorial of this project, check out How to Make Colorful Layered Fabric Flowers.